Trey Hoerner of Abilene captured the 4A 182 lb. state wrestling title in Salina on Saturday. Abilene senior wrestler Trey Hoerner has been named the Nex-Tech Wireless Central Kansas Athlete of the Month for his athletic performance over the month of Feburary. Hoerner, who wrestles at 182 lbs., won the 4A State Wrestling Championship in Salina last weekend and finished his senior season with an outstanding 40-1 record. Hoerner won a 6-4 decision in the 182 lb state championship over Ryan Tiers of Clay Center. Hoerner was the only individual champion this past weekend for the Cowboys, who went on to win the 2017 4A team title. Nex-Tech Wireless would like to congratulate Trey and the Abilene Cowboys for an oustanding season of wrestling! Trey Hoerner (Abilene) 40-1, Jr. over Ryan Tiers (Clay Center Community) 32-8, Sr. (Dec 6-4). 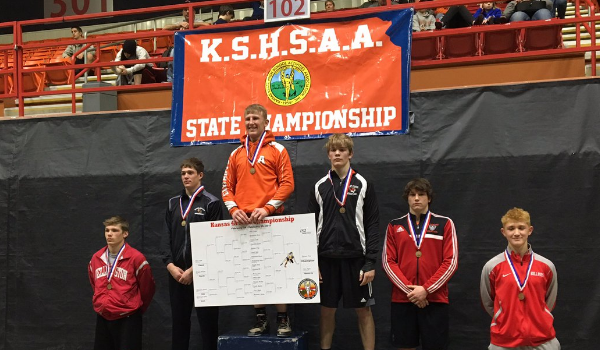 Beck Elliott (Lindsborg-Smoky Valley) 29-6, Sr. over Braden Morgan (El Dorado) 35-3, So. (Dec 2-1). Aaron Schoemann (Wellington) 31-14, Jr. over Bailey Yarborough (McPherson) 26-12, Jr. (Dec 5-3).